Year-round art gallery located at 154 Middle Street in the arts district of the Olde Port, Portland, Maine. Beautiful, bright, contemporary gallery just a short distance from Portland Museum of Art. 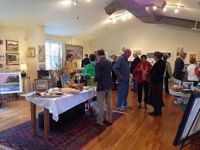 Beautiful gallery space located in York, Maine providing exhibition space for emerging and established artists of Maine and New England. Year-round gallery located at 44 West Brook Street in Manchester, NH. Established gallery with a wide variety of artworks from artists around the country. Art3 carries my coastal-inspired work as well as NH-inspired farm and woodland paintngs. 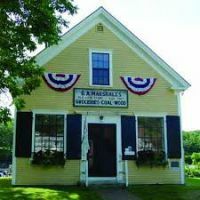 Full service, year-round gallery in Chatham, on Cape Cod, MA. Bright new location, plenty of parking, and easy access. Since 2009. Gallery owner, Domonic Boreffi. Year-round gallery and frame shop. 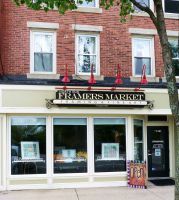 Purchase original art and have it framed just the way you like it all in one centrally-located shop in downtown Portsmouth, NH on Market Street. Find my original works of coastal and local Portsmouth paintings. Prints and note cards of local area available. Conveniently located in the heart of Camden, Maine. Stroll historic streets filled with the essence of classic Maine. Follow the roads to the Public Landing to find the harbor-facing entrance to the gallery. High quality frame shop centrally located on Elm Street in Manchester, NH. Carries a variety of my original works. 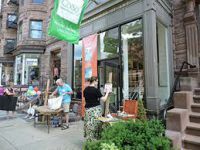 The Copley Society of Art, Co|So, is the oldest non-profit art association in the United States, with a history dating back to 1879. 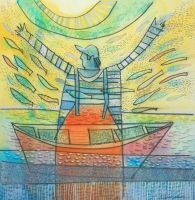 We currently represent over 400 living artist members, ranging in experience from students to nationally-recognized artists and in style from traditional and academic realists to contemporary and abstract painters, photographers, and sculptors. The gallery hosts between 15 and 20 exhibitions each year, including solo exhibitions, thematic group shows, juried competitions, and fundraising events. 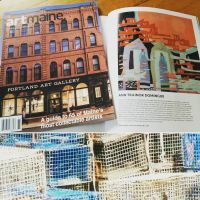 NH Art Association home page, to purchase of puzzle with proceeds supporting NHAA programs, contact NHAA via website or purchase at Sheafe Warehouse in Prescott Park in Portsmouth, NH during summer of 2017. 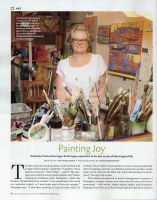 In depth article about my art process written by Lori Ferguson, published by Design New England 2016. My artwork, Lined Up in Blues, was selected to be published in this first ever issue of AcrylicWorks 2014. It is found in the Realistic Abstractions section on page 96-97. This book presents a broad range of paintings created in various styles all using acrylics. NorthLight Books publishing site, publisher of AcrylicWorks 2014. Go to Amazon for purchases. Become a fan of my art by clicking LIKE at the top of my Facebook Page. You'll be in the know on a timely basis for events, happenings, as well as inside information on my creation process. Written for fans, collectors and artists. Details of technique, style, inspirations and approaches to give insights into my work--written in a fun, informative style. Home page for New England Watercolor Society, member organization for painters specializing or using watercolor as preferred medium. Exhibition schedule, members and sample artworks, contact information.